I also pointed out a benefit that goes beyond escaping the trap of billable hours — you’re creating a company that could be acquired. That’s what happened when WP Curve was acquired by Go Daddy, and today WP Curve co-founder Dan Norris joins us to talk about how he created his former company. This episode of Unemployable is brought to you by Productize, the training course that teaches freelancers, consultants, and other professional service providers to escape selling their time for money. Discover a step-by-step methodology for creating a value-added, systemized, “done-for-you” offer, packaged neatly as a product with a defined scope and price, so you can break free from billable hours. Visit unemployable.com/productize to find out more. Dan was initially interested in software-as-a-service, but struggled to get traction. It was at that point that he latched onto a recurring revenue model like SaaS, but with a service performed by WordPress developers across the globe. Listen in for more details. And find out what this restless entrepreneur is up to next. Dan Norris: I’m Dan Norris. I’m an online entrepreneur, a failed software entrepreneur, a beer drinker and maker, and obviously, that makes me unemployable. Voiceover: Welcome to Unemployable. The show for people who can get a job, they’re just not inclined to take one, and that’s putting it gently. In addition to this podcast, thousands of freelancers and entrepreneurs get actionable advice and other valuable resources from the weekly Unemployable email newsletter. Join us by registering for our free Profit Pillars course, or choose to sign up for the newsletter only, at no charge. Simply head over to Unemployable.com, and take your business and lifestyle to the next level. Brian Clark: A few weeks back, we looked at a process that you can use to transform your business. The example I gave was for a freelancer to ‘productize’ an aspect of their services into a neatly packaged product with a defined scope and pricing. I also pointed out a benefit that goes beyond escaping the trap of billable hours — you’re creating a company that could be acquired. That’s what happened when WP Curve was acquired by GoDaddy, and today, WP Curve co-founder Dan Norris joins us to talk about how he created his former company. 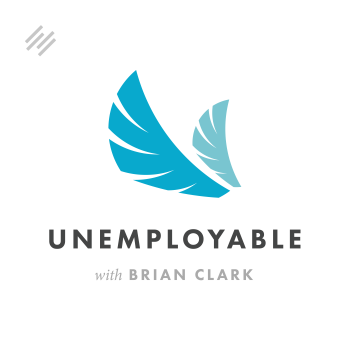 I’m Brian Clark, and you’re listening to Unemployable — smart strategies and top tips for independent business people. Thanks for listening. This episode of Unemployable is brought to you by Productize, the training course that teaches freelancers, consultants, and other professional service providers to escape selling their time for money. Discover a step-by-step methodology for creating a value-added, systematized, ‘done-for-you’ offer, packaged neatly as a product with a defined scope and price, so you can break free from billable hours. Visit Unemployable.com/Productize to find out more. Dan initially was interested in software as a service, but struggled to get traction. It was at that point that he latched onto a recurring revenue model like SaaS, but with a service performed by WordPress developers across the globe. Listen in for more details, and find out what this restless entrepreneur is up to next. Dan, thanks so much for being here, man. How are you? Dan Norris: I’m good, thank you. I’m sorry I stood you up last time. My only excuse was I was too busy surfing, which is pretty poor, but I’m very happy to be on your show. Brian Clark: We got to tell people the backstory now. Our first scheduled interview time, I had a kid issue and then completely zoned. I just hate to do that, and I’m always embarrassed. I try never to do it, so I’m feeling bad about it. Then we reschedule, and then Dan doesn’t show up this time. I’m like, “God, I hope he’s okay.” It turns out he was surfing and drinking beer because it was Australia Day, and I’m like, “I can’t really criticize that.” That’s one of the best excuses I’ve ever heard. Third time’s a charm, though. Dan Norris: Yeah, well, I always feel bad about that, too, and being 9 am in the morning, it was probably not appropriate to be drinking beer. Brian Clark: I go, “Dan, you’re drinking beer at 9 am?” He’s like, “It’s Australia, mate, it doesn’t matter what time it is.” I thought that was a good response, too. All right, so we’re going to talk a little bit about the company WP Curve that you recently sold to Go Daddy. We can’t get into specifics on terms about that, which is pretty common. But to me, that’s cool, but it’s not the interesting story. I think it’s more interesting to talk about how you got there and how you developed that company into something that a company like GoDaddy would want. Before we get to that, why don’t we go back a little bit. I know you had a corporate job in your mid-20s, and then you did some other stuff before eventually arriving at the thing that really worked well. So take us back on the journey from the last time you had a job until the beginning of WP Curve. Dan Norris: Right. As far back as I can remember, I was sort of interested in building some kind of online business. Even at university, I think that would have been like 2001 … in Australia, the Internet barely existed in 2001. You had to go the library to do research for assignments. But I was still interested in this idea of starting an online business. I put a business plan together for a topic called entrepreneurship, selling stuff online, and I never followed through with it. I went and got a job in the government, which was a lot of fun, but it was a human resources job. I did human resources at university. Again, I just wasn’t interested in that side of it; I was more interested in the technology, so I weaseled my way into e-learning and building an app for the company I worked at, like an online web-based app thing. Eventually, I left in 2006 and just decided I was going to build websites for people, even though I’d never built a website before. I wasn’t a coder. I literally just stopped. After getting a promotion, I quit. The next day, I went to a meeting and told some guy I could build his website, and he said, “Can you build in ASP?” I said, “Sure.” And then I went out and bought a book on ASP. This is 2006. I think WordPress and Joomla existed at the time, but no one was using them. The idea of using CMS was very foreign. Brian Clark: WordPress in 2005, that’s when I started it, and then my first major site with it was January 2006, which is Copyblogger. So yeah, it was very new then. Dan Norris: You were super early. From a business point of view, using something like WordPress to run business websites … even when I sold the business in 2012, that was sort of when I was starting to get into actually just building people WordPress websites and using nothing else. Between 2006 and 2012, it went from building your own CMS for every single project on ASP, PHP, or whatever using Joomla, using something like Magento for e-commerce sites. Then towards the end, WordPress just kind of took over and it made no sense to use anything else. It wasn’t a successful business. I actually tried to get out of it a lot of times. I didn’t know what I was doing. I had no clue what I was doing. I tried everything to fix it. I couldn’t fix it. Eventually, again, I just cut myself off at the deep end. I had an idea for building an analytics dashboard. It had the most embarrassing name. I’m not even going to say the name. It’s so embarrassing. Brian Clark: Oh, come on, you got to tell us the name. Dan Norris: Okay, I will tell you the name. No one knows this, by the way, because this product eventually evolved into something called Inform.ly. I was gradually learning how to brand and how to name things, how to make things appear like they’re a real startup and get press for them, and I eventually got to this idea of Inform.ly, which was an analytics dashboard. But it started like a year or two before I sold my agency as a product called Casbir, and it stood for Centralized Analytics something dashboard … something just crazy like a government agency. I can’t even remember what it stood for. I’d have to look it up. Brian Clark: I remember reading somewhere that you changed the name to Inform.ly because you wanted it to sound like a proper Internet startup. Dan Norris: Yeah. Well, what I did was, when I sold my agency, I sold it for about 70,000, Australian dollars, so $50,000 US. You can live for about a year in Australia, definitely the way I live, drinking craft beer and three paid-for coffees a day on that much money. That’s basically how long I had to build this other business. I had a bunch of ideas. One was a pot plant stand. The other one was an app for surfers to check in to their surf break. The other one was this Casbir thing, and I thought, “This is literally the only one. This is software. I want to do software. I’ve started it. I may as well finish it.” So I renamed it to Web Control Room because I found the domain, WebControlRoom.com, which I thought was cool. But now I just think just sounds old school. Then I rebranded it to Inform.ly halfway through because I wanted it to sound like a startup and get startup press and stuff like that, which I was able to get. But I wasn’t really able to sell any subscriptions. So a year later, I had absolutely no money. I had two developers I was paying full-time. I couldn’t pay them. I’d sold my house because we just weren’t making enough money to pay for it. And I was starting to look for jobs, and that’s when I launched WP Curve. Brian Clark: Wow. I had no idea. I remember the last business didn’t do well, but it almost seemed like you just kind of magically segued, but no, selling the house and thinking about getting a job. You had one of those back-against-the-wall moments. I did the same thing with selling the agency. I really had no idea what I was going to do, but I knew the agency wasn’t working. I never made more money per year with that business than I did working for anyone else, probably not even half as much. It was just constant work and constant disappointment. So yeah, I put myself in that position deliberately. Whether that was a good idea, I don’t know. It resulted in ultimately coming out the other side in a good position, but there was a lot of stress and a lot of bad stuff that happened in the middle. Brian Clark: Yeah. I’ve done that twice, too — when I first quit the practice of law in the late ’90s and then right before I started Copyblogger. Both times, it was the right thing to do. I think certain people like pressure or operate well with pressure, and I’m one of them. It sounds like you are, too. Dan Norris: Yeah. I think that there’s a bit of luck involved as well. I could just be working at a job right now, unhappily, so easily. Literally, I launched WP Curve, it just took off. I don’t think there was any real brilliance in there. There was a lot of luck. It was good timing. I had an audience from the content I was doing with Inform.ly, and the pieces came together. But I could be very easily working for someone else unhappily, living back in the city, and you would never be interviewing me. Brian Clark: Yep. Well, luckily, that is not the case. I actually mentioned WP Curve, I don’t know if it was last week or the week before, I think it was two weeks ago, but go ahead and explain to people what the company did. Dan Norris: Basically at the time, in a desperate situation, for the whole time, I wanted to be a software entrepreneur. I wanted to build software. As you know, software as a service as a business model is kind of like the Holy Grail. I enjoy building software, and this is what I wanted. But with a week or so before completely running out of money, there was no time to build software. I’d spent a year building it. Every time I’d built software, it hasn’t worked. So services was the only option. Literally, my only idea was to take as many elements as I could out of what I thought was the ultimate business model and bake them into a service that I could launch in seven days. I had an audience who knew me from building websites. I knew WordPress. I was inspired by other companies who were like specific WordPress, like WP Engine, ManageWP, companies like that. Granted, they’re software and hosting, but the idea of just doing a WordPress-specific things seemed to be working for people. I just decided I would do unlimited small jobs for a subscription fee of $70 a month, I think, at the time. Really, it didn’t change too much. I think we ran it for three years before selling it to GoDaddy. The only change really in that time was we grew. We grew from zero to 1,000 or so customers and about a million dollars a year in annual recurring revenue. We put the prices up, had higher-level plans. We built a team. I brought in co-founder in the US, and we had a team in US managing a team of 30 or so developers around the world. Other than that, nothing much changed. It just grew. We got 10 customers in the first week, and we got about 10 customers a week for the first couple of years. Brian Clark: So this was around 2013 that you started? Brian Clark: Okay, so at that time, because what you did is now called ‘productized service’ or ‘productized consulting.’ Was that terminology that you were familiar with at that time, or are you just trying to emulate a software as a service model, but with an actual service? Dan Norris: Well, the word ‘productized service’ has been around for a long time, but that really just means turning your services into products that people can buy. It doesn’t necessarily mean a recurring subscription. Brian Clark: Right. It can, but not always. Dan Norris: It can, yeah. It can, and at the time, there was a lot of talk about productized services, but there was very few examples of people who’d built a service business that was operating like a SaaS company or even that was doing particularly well in the online space. People that weren’t really making the majority of their money from affiliate marketing or selling info products about how to build a productized services business. There really wasn’t that many success stories. WP Curve became this success story for doing recurring services, for doing productized services, and also for this idea of doing unlimited services. It started emerging. People would be like, “We’re doing WP Curve for accounting,” or, “We’re doing WP Curve for design.” People started using that language, so I think that really helped our brand. And people started using The 7-Day Startup language – like, “This is my 7-day startup business.” And they’re all sort of the same. It was like, “Unlimited Shopify fixes for $200 a month,” “Unlimited design for $1,000 a month,” or whatever. So I think WP Curve sort of started that wave of productized services. But the word ‘productized services’ was around. I think people were just looking for an example of it working really well. Brian Clark: Yeah. And that’s why I mentioned the company a couple weeks ago — because it is a great example. Because it is recurring. It has all those great elements that we’re looking for because that recurring revenue is so stable. Now, it’s interesting to me because you took a service that, for your normal WordPress developer, is kind of a nightmare. It’s these little tweaks. People don’t want to pay a lot of money for them. You would have to do a huge amount of volume as a solo developer to make a good living off of that. That’s why most people don’t like to do that stuff. Brian Clark: How did you come up with the idea that you could get away with unlimited and make it work at that price point? And I guess the hypothesis was, “If I do it, people are just aren’t going to have that many problems with their site. You might have two or three problems a month, but you’re not going to have 100 problems a month because it’s only one website.” I thought there’d be some economies of scale, of having to fix the same problem multiple times, having a team that literally all they do is solve problems, so they get quite good at it. Limiting it to 30 minutes so people can’t request massive jobs. I had some hunch that maybe that would work, and it wouldn’t get abused. The more important part about that is, all entrepreneurs are always trying to guess what’s going to happen and try to be right about what’s going to happen, whereas this is something I could test in a month, easily. I could just put up a landing page, send people a link to sign up with a PayPal button, and see what happens after a month, see how many jobs they request. And that’s what I did, and I found very quickly that it was very, very rare for someone to abuse the service. And if they did, it was pretty easy for us to manage. Brian Clark: Yeah. It’s like insurance. It makes people feel better that there’s someone on call, but it doesn’t come up all that often. And if it does, sometimes you got to fire a client, which I’m sure your terms of service let you do. At the very beginning, as a test obviously … and that’s another good lesson — don’t be afraid to just put something out there. If it doesn’t work, who cares? No one’s going to remember in six months, you know? But at the beginning, was it basically Dan saying, “Okay, I’ll handle this stuff, assuming I get 10, 50 customers, whatever,” before you started working with other developers, or did you go in with some other people on the team? So I had him, but he worked my time zone, too. And I committed to doing 24/7 because I just wanted to take any objections out of it. So I had a live chat app on my phone that I’d paid for with Inform.ly, so I could chat with people live on the site. I just put that in my phone as I went to sleep at night. If it went off, I took the customer’s chat and allocated the job for Andrew in the morning. It was a 24-hour turnaround. So he could always do it the next day, and we’d still be meeting the service terms. We did that for the first 10 or 20 customers, and then I started employing more developers. Brian Clark: Yeah, so let’s talk about that. Once you say, or see, I should say, “Hey, this is going to work,” how did you go about developing that team? I know you mentioned that eventually you had someone to manage it, but I would guess that that was up to you at the beginning. Dan Norris: Yeah. I’ve gotten pretty good at working with Filipino staff. I’ve learnt from guys like Chris Ducker and James Schramko, and probably earlier on, John Jonas was putting out a lot of content on it. Dan Andrews was putting out a lot of content on it. I delved deep into that, and I was hiring a team of guys in the Philippines with my agency to do SEO work. I’d become okay at hiring in the Philippines. So it was just a simple model. It was as soon as we got 30 clients, that was too much for one developer to handle. We had a trigger where we had to hire another one, and we put together a test, which my developer helped me with. And he would analyze the test results. It was a test website. We’d ask them for a bunch of changes. If they got more than 80 percent, we hired them. We put a bit more structure around that towards the end, but that was pretty much what we did. Brian Clark: That’s interesting. I like that. Okay, so a three-year run culminates in an acquisition. That’s successful by any measure. A lot of things went well. Give us some examples of things that surprised you, that went badly. Dan Norris: It’s not all perfect. In my perfect world, I would have started it, and I wanted to get 10,000 customers. I wanted to build something scalable enough to get 10,000 customers. That became clear that, that wasn’t going to happen if we kept with the same model, to me, because I think the recurring model had some issues with retention. That was really something we were never really able to fix. Brian Clark: Were you finding that people ended up not using it, and therefore, they churned out? Dan Norris: Yeah. And for the first two years, growth was fast outpacing that. But for the third year, it was pretty much on par with that, and the growth had slowed down. We were still growing, but we weren’t growing 10 percent a month like we were in the first two years. It became clear at that point, something was going to have to change in that third year, and there was a lot of options. One was selling. Another was implementing a different model, which could have happened, but it would have required a lot of work from me and the co-founder. Maybe some outside investment. But there was a lot of options floating around. Or we could just leave it as a business that was doing a million dollars a year with pretty good margins, where we worked very little in the business, which we kind of did for the last year. All that stuff was going on. It was a good business, but it wasn’t exploding in the third year like it was in the first two. So we’re sort of looking at options. And the option to sell, to be honest, for the way it worked out, was as good an option as could have been possible, I think. Brian Clark: Yeah, it sounds like it. Now tell me, GoDaddy, with its resources, I would imagine could have started up something like this on their own, but they came to you. Why do you think that was? Dan Norris: I think it’s harder than you think for big companies to start anything. Brian Clark: You’re right, and it’s so much easier to acquire. They get the goodwill. They get the brand. They get the affinity that you have with your audience. I guess I knew the answer, but I wondered from your perspective. I agree. Dan Norris: They also were very interested in the team. They didn’t have a lot of off-shore service-based team members, and they were getting into that part. Their business was getting into that side of things with managed offerings and stuff like that. They were probably more interested in the team than anything else. I know they were looking around at a bunch of companies, and because we’d done so much content — we were out there, people knew about us — they found us, essentially. We’d talked to a couple of other companies about an acquisition, but it really fell into line very well. Again, I feel like there was a lot of luck involved from both sides. It just worked out. One of those things that just worked out really well. Brian Clark: Yeah. Like they say, you work really hard you get lucky a lot. About how long from the time of first contact to it closed? Dan Norris: Six to eight months, I think. It was quite a long process. I was over there in June, actually on the day our brewery launched in Australia. I was launching a brewery at the time, and it was getting delayed and delayed and delayed. I was like, “I’ve got this trip planned to the US,” which was sort of more of a general trip to the US. It wasn’t really around anything in particular. But we’d organized this meeting with GoDaddy on the 18th of June. Then just randomly with the brewery, on the 17th of June, we’d got the fix to the part that we needed to start the brewery, so we just decided we’re going to open the next day. I was in America meeting with GoDaddy while my mates were opening this brewery that we’d worked on for three years to try to open. Brian Clark: I want to talk more about the brewery because I don’t know that story yet, but that’s interesting. But you’re also an author. We’ve already mentioned The 7-Day Startup, which is a great book. We’ll put it in the show notes. It’s worth everyone reading, especially if you’re interested in trying to come up with this kind of model. You’ve written four books, right? Brian Clark: Yeah, four books. That’s pretty good. You’re a busy guy. Dan Norris: Yeah, in the last three years, I think. Brian Clark: Not bad, not bad. Okay, before we talk more about that, though, do you have specific tips to people. We’ve got a lot of freelancers listening — consultants, entrepreneurs without a business model or a product yet. If they’re really after a recurring revenue model that doesn’t involve software development — which, trust me, it’s not easy — what can you share with people that you think will put them on the right track? Whether it’s looking at an aspect of your current professional services — you could be a designer, writer. I’ve seen various attempts at productized recurring models for repeatable tasks. Content is a big one. But I think that’s hard to tamp down like you did with the WordPress fixes. So what do you have to say to people? Dan Norris: God, there’s a lot to say. I think the big thing that people probably don’t get right is, you got to remember it costs a lot of money to run a business. It costs a lot of money to deliver a service. We’re hiring developers in the Philippines, which are very cheap. They’re spending a couple of hours a month on a client’s website, max. And then we’re charging, on average, $99 a month. Brian Clark: Yeah, not at the quality level that people want. Dan Norris: That’s right, and people expect quality. You need to find a problem that can be fixed for a price that you can multiply probably by 10. It represents good value to people. That’s what you need to do. For me, $50 a month, $100 a month is good value to make sure your WordPress website is not going to run into issues that you can’t solve within a day. But you can employ people in the Philippines quite cheaply, pay more than they would get elsewhere, and the numbers work. If you’re choosing high-end article writing where you’re going to have to pay people, say, bare minimum $500 for a really, really good article, if you’re doing two articles a month, that’s $1,000. You’re going to have to charge $5,000 a month by the time you add everything in. You add management. You add SaaS costs and everything else in and have a margin to make money. You’re going to have to charge $5,000 a month. So you need to find something in the middle, assuming you want to build something that grows beyond yourself. To me, that was the whole point. I’d done an agency that never grew beyond me. That’s fine if that’s your goal, but if that’s not your goal, you’re going to have to find something that ultimately can scale, to a point. This is the other thing. It’s not like something can scale indefinitely. A recurring services model is probably only going to scale to a point. An agency is probably only going to scale to a point. The most scalable business models in the world, you might be able to turn into a billion dollar company, but they’re going to be impossible for entrepreneurs like you or I to start. It’s just this massive balance of what’s easy to start, what can you, first of all, cover the first hurdle, which is paying your own wage and making sure you don’t have to get a job, and then scale to a point where it turns into really nice business. That’s the stuff I was thinking about with WP Curve. I don’t think WP Curve was perfect. The one thing I would change with WP Curve is, if you could think of a business model that presented users with a need that is not going to go away. If you think about MailChimp or hosting, unless you go out of business, you’re still going to need to send emails. You’re still going to need to host your website. That need doesn’t go away. With website fixes, there’s an argument to say that, once you fixed it, you no longer need the service. And I’m sure there was some percentage of churn that was factored into that. If you can think of a recurring service where that’s not the case, you’re probably onto a better business model than WP Curve. Brian Clark: Yeah. It’s interesting. There’s a company in Austin, I think, Inbound Engine. Apparently, all companies in Austin have to have ‘engine’ in their word — like our friends at WP Engine. But what they do is, they developed their own in-house technology so that they could be efficient enough to provide the same similar type of recurring monthly service to realtors for social media marketing. So basically, they handle all their social media posting. I don’t think they create content, I don’t remember. But they only can make that work because they also have technology that increases their leverage and efficiency. Dan Norris: Yeah, that’s right. And that’s the other really big part of the equation. For most of the entrepreneurs in my audience, or your audience, we can’t actually afford to market a business. That’s the reality. Everyone’s talking about, “Okay, do Facebook Ads, do paid ads.” When I started, it was do Yellow Pages. But almost every entrepreneur I know does not have any money for advertising. It comes down to, “Okay, I can offer a $1,000 a month service, but is the sort of marketing I’m doing and the sort of influence I have over my people, is that going to translate to a $1,000 a month service? Do I have anyone in my audience who actually wants to pay that? Do I have any companies that are listening to me, that trust me?” By the way, I learned half of this stuff from you, back in the day. But that’s where the content needs to match the product. I can be blogging all day about making money online, and then I have all these Internet marketing fanboys in my audience, and come out with a product that’s $1,000 a month — and no one’s going to buy it because no one’s got $1,000 a month. So there needs to be a nice fit between the marketing influence you have and the actual product you’re selling. Brian Clark: Yeah, you’re absolutely right. Okay, how about this? Say you’re a freelancer and you’re tired of the drain of dealing with clients one on one. Basically, every day is a new adventure, which can be fun for some people and draining to others. So maybe they’re not going to come up with the recurring thing, but do you still see as a valid exercise trying to pick an aspect of the services you provide — whether it be design, content, coding, whatever — and at least uniformly bundling it so that you really can scale a little? It doesn’t have to be you preforming you the service. To me, back 12, 13 years ago, I would’ve killed for something like that because it was dealing with the clients that was killing me. Dan Norris: Yeah, absolutely. I think that’s the way to go. I’ve never been an advocate of 100 percent recurring. In fact, WP Curve wasn’t 100 percent recurring. We did one-off jobs as well. But I think if you look at successful businesses, something that everyone seems to be missing is, in a lot of cases, they’re not 100 percent recurring. But what they are is 100 percent consistent. So I think that’s the missing ingredient. I’ve got a guy in my Facebook group, during the week is saying, “My wages bill is going to hit $60,000 a month now because I’m employing more people,” and he’s got a monthly recurring revenue of $5,000 a month. The rest is from projects. To me, it’s the consistency that’s the problem. If he has a $5,000 month two months in a row, he’s out of business. Most people would not make those hires because the gap between what they know is going to come in next month, whether it’s recurring or not, is too big between the gap of what they know they’re going to have to spend to make those hires. That’s what holds back growth. I think, by all means, the ultimate is having 100 percent recurring, but I guess the elephant in the room is that a lot of people don’t want to pay a recurring fee for something. There’s definitely options for having consistency in a business that isn’t necessarily recurring, or maybe you have a percentage recurring — maybe a 50 percent or 70, 80 percent recurring. You try to incentivize recurring. But the other piece of the puzzle you got to remember is, if you incentivize recurring too much, you’ll get people who don’t actually want to pay recurring fee signing up to the recurring plan because they don’t have another sensible option and then churning. Then you have a churn problem. It’s a complex situation going into the recurring business. But by all means, doing freelance work, doing agency work is a terrible business model. Anyone doing that, unless they’re happy in the situation they’re in, then they need to completely rethink what they’re doing and either start something on the side while they’re doing the freelancing, which is probably more sensible than what I did. Or they just quit and get an epic team together and build something that’s going to stand out and do something more significant that can grow. Brian Clark: Amen to that. I know there’s a lot of people out there that would be down for that. But whether they’re a back-against-the-wall type like you and I might be, or they need to do the side hustle. Dan Norris: The other part of the equation is just the risk. Again, I feel that part of the reason I wrote The 7-Day Startup was that I felt like no one was talking to this audience of freelancers and first-time entrepreneurs — people who are in business or they’re freelancing. They’ve got an agency, but they really haven’t had their breakout success. I was in business for seven years, but it didn’t occur to me that I was an entrepreneur. I just kind of was working for myself. But no one was really speaking to them, and I think a big part of what needs to be said to them is, “Make sure you understand the risk that you are taking.” To me, I was like, “Well, I’m going to start this software business. I know it’s a bit of a risk. Any business is a risk.” But I really had no capacity of how big a risk I was taking, starting a business, competing with funded companies, competing with companies who hire the best designers in the world to execute the best product via the best coders in the world. You’re almost signing up for certain failure doing that. I’m working on another software project now where I’m knowingly signing up for that certain failure because I’m in the position where I can fail and it’s really not going to make a very big difference to my life. Whereas back then, it could’ve turned my life completely upside down. I think the only difference really is, just make sure you know the level of risk you’re taking. Again, I’ve got people in my groups who are starting these software projects and they’re sort of in with all the other entrepreneurs, but they’re not making any money. I worry that they don’t really understand the extent of the risk they’re taking and whether or not they are in a position to take that risk. Brian Clark: Yeah, that’s good advice. So since 2006, you’ve pretty much been an online kind of business guy. Yet now, you and some of your mates own a brewery. How did this happen? Brian Clark: That’s how every great story starts. Dan Norris: Yeah, not normally how great stories end though. But in this case, it just happened that one of the guys, he’s my best mate, he was very, very keen to quit his job. Eventually, ultimately, he got a redundancy, which gave him a bunch of cash to put into a business. My other mate was a brewer at the top breweries in the area, and I had just put out Content Machine, the book I was getting known as a content person. I had an audience. I always thought it would be cool to work on physical product. The idea of building a brewery didn’t really cross my mind. But it was a perfect storm. We brewed this test beer just because Eddie had this good idea for a beer. My other mate, Govs, who was a brewer, thought, “Yeah, I can do that. I’m a home brewer.” He literally just got a home brew set up that he was keen to test out. Brian Clark: It was kind of like you with ASP, right? Dan Norris: Well, the only difference was he was actually an accomplished brewer. It was new to him to do home brew. Brian Clark: Okay, so the equipment was new, but you made up the whole thing yourself. Dan Norris: Yeah. So he brewed on massive equipment before and had brewed all these epic beers, but he had just got a home brew system to start experimenting a bit more. And I just got carried away with the marketing. We’re brainstorming names 24/7. We arrived at the name of Black Hops. Before, the beer was ready in two weeks, we had an Instagram account. I’d done a design for a label, printed them out. We’d labeled the beer. When we opened it, it looked like a proper beer you’d buy from the shop. It was really good, so we sent it off to bloggers. They started writing about us. We then brewed a commercial back to someone else’s brewery, had a launch of the business. We couldn’t find anywhere else to brew, so at that point, that was about 18 months ago, we decided, “Well, if there’s nowhere else to do it, we’ll build our own.” That’s basically what happened in 2015, 2016. Brian Clark: And the brewery’s located on the Gold Coast? Dan Norris: Yes, so we’re in Burleigh on the Gold Coast. We’re probably 200 meters to the beach. We’ve got cafes all around us. We’re in a very small 300 square meter building. We got a two and a half thousand liter system with a bunch of tanks, some as big as 4,000 liters. So we’re probably the biggest brewery in that size space that you can possibly fit, but still very much a micro-brewery. And also a bar. We’re open six days a week. People walk up to taste the beers, to get takeaways. We’re a real physical thing. Brian Clark: Excellent. I know I’m going to end up buying a bar or a restaurant, and it’ll be the thing that ruins me. You just know that that’s what’s going to happen, but that’s all right. Okay. Besides the brewery, what’s next? Surfing? Beer drinking? Dan Norris: Yeah, this year I want to surf more. I set a goal of surfing 100 times. I’ve already surfed five times, which is probably more than I surfed last year. I live on the beach, and there’s waves out the front almost every day. And I’ve got six surfboards, so there’s no excuse. The first month of this year, I haven’t done much at all. I had a bit of a health scare, so I was kind of laying low, not doing much. It turned out to be nothing, but I really just didn’t do anything in January –which maybe is a blessing in disguise. I’ve been working really hard for a long time. But I am working on software project. I’m going to do it a bit differently this time. I’m not going to do the whole sort of ‘follow the journey.’ I’m just going to build it, and I’m going to launch it when it’s ready. If people like it, it’ll turn into a business. If they don’t, I’m going to lose a bunch of money, which I can now afford to lose. I’m just not quite ready to give up on the dream of being a software entrepreneur yet, so this is one last attempt. I’ve also started making animated videos based on podcast interviews, which I thought was fun. Now I’m going to turn that into a service for doing explainer videos because that will pay for the staff member I’ve employed to do the funny ones. So that’s it. That’s all I’m working on. I got the brewery. I’ve also got personal membership on DanNorris.me with 200+ members. I’ve got four books. I’ve started selling them directly on my site now as well. So juggling a bunch of things but just trying not to get too carried away with getting deep into anything. Brian Clark: For someone who’s taken some time off, you sound pretty busy to me. Dan Norris: Well, I don’t know, I don’t really know what to do other than doing stuff [crosstalk 00:41:39]. Brian Clark: See, that’s what happens. You think you just want to surf all day, but you’re brain doesn’t turn off. Next thing you know, you’re doing something else. But that’s all right. Dan Norris: It’s been good to have a break forced upon me, but I can max there for one hour a day, for the other 23 hours I’m thinking about building some sort of online business. Actually, I had another idea the other day for cooler products for beer-related stuff. So I bought a domain yesterday for that, CraftCooler.com. So I’m thinking about working on some physical products as well. Brian Clark: Well, you know what, Dan, I appreciate you taking time away from morning surfing to be here. You got a great story. You probably haven’t even done your biggest thing yet. That’s my take on your kind of drive. But that’s how entrepreneurs are, so that’s cool. So thanks a lot, man, best wishes in the future. Dan Norris: Well, thank you so much. It was cool to hear that you read my book. I haven’t had much to do with you in the past, but you probably don’t know that your blog, and only probably one or two others, really got me into this idea of content marketing. That’s what drove every single business I’ve ever launched, including the brewery. That content was the whole reason why that thing got off the ground, so thank you for that. If you didn’t know that, hopefully that’s cool to learn that. Brian Clark: No, it’s amazing. I still never get tired of hearing that, and even better, when you send me that check from your payout … never mind. Dan, thanks a lot, man. Dan Norris: Cool. Thanks, Brian. Brian Clark: All right, everyone. A lot of good nuggets in there, lots of good advice. If you can find a model that supports recurring revenue, then chase it. It doesn’t have to be software. It can be a service. But if not, just find a way to package up things so maybe the clients don’t wear you down. But in any event, we’ll talk next time. Thanks for listening, and keep going.